There are many reasons why the first-generation R1 4XV is already a classic – aside from the way prices have been going. 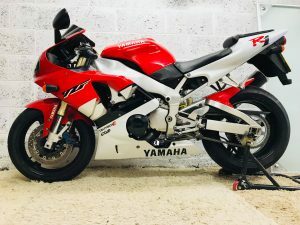 Firstly, it was a real game-changer, like the Honda CBR900RR FireBlade and Yamaha FZR1000 before it. Back then, 150bhp claimed was the stuff of fantasy, but then there was the YZR500-inspired Deltabox II chassis (with longer swingarm for better traction, this came from the YZR racers) the fiercely powerful Blue-Spot Sumitomo calipers but most of all, the original 4XV still ranks as one of the best-looking bikes to ever come out of Japan. Reliability-wise, the five-valve per-cylinder motor was spot on with many owners hitting 50,000 miles with no drama other than filter and oil changes. What we would say is that you can easily avoid tuned machines as – even today – you don’t need more for the road! 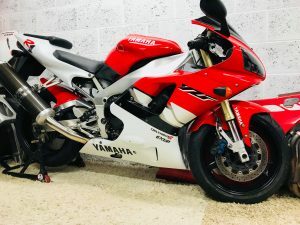 Yamaha used to have issues with clutches and brake discs warping with earlier FZRs – but it was only a clutch recall on those first models of R1 that blighted the bike, although second gear was reportedly weak on some machines and of course the EXUP valves can stick if not serviced. Also, frames/subframes can be so light they can be damaged easily in the smallest of crashes, so watch out for polished frames or carbon frame-rail covers. The tacho/dash was one of the first digital speedo units and it also gives diagnostic info, so check this when you switch it on as it jumps to a pre-set level to tell you what’s wrong with the bike. 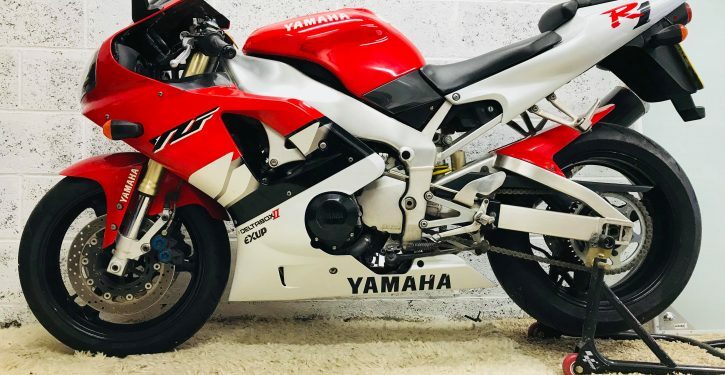 While the launch models from 1998 are good investments, the second year saw a classy ‘competition white’ model (more a copy of the WSB Yamaha race colours) while the 5JJ model (2000-2001) was better still, with improved handling, less weight (175 kilos from 176 or so), smoother motor (carb changes) and a better gearbox. Bodywork was similar, but all-new so it still looked good. Owners say not to worry about not having original end cans: the carbon 4XV and titanium 5JJ ones can be found on eBay for a few quid. For: Still goes good, still looks great! Against: Some issues, hard to find a good one at a good price! Major changes Gearlinkage change 1999, colours, then 2000-5JJ bodywork, gearbox, carb, end-can changes. Verdict: Already a classic and now up there with the Blade and LC!